Aqua aerobics (water aerobics) is one of the types of gymnastics. Water makes exercises easier, this is due to the fact that the water increases buoyancy. The great advantage of these exercises is also that they minimize the risk of injury. All this makes water aerobics an ideal solution for people who are overweight and have injuries to their motor organs. Aqua aerobics is also an excellent alternative for all those who do not like the traditional form of exercise. exercises with so-called “noodles” (noodle workout) – the use of “pasta”, or displacement foams, allows you to do a lot of exercise. You can sit on them or push them. This type of exercise is perfect for strength training and rehabilitation. Gymnastics in the water is also performed to the rhythm of dynamic music. The pool exercises more pleasant. You can also feel much more freely than in the gym. 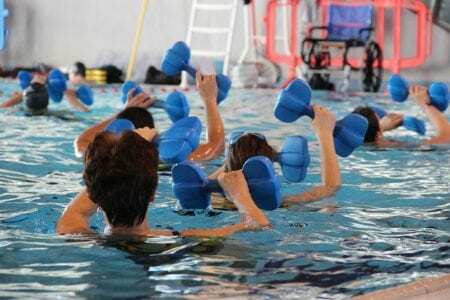 During water aerobics, special instruments are used to vary the training and make it more safe and comfortable. Usually, displacement foams, helpful special gloves and special dumbbells for aqua aerobics are used. The popularity of aqua aerobics is getting bigger every year. It enjoys great popularity especially among women. This is one of the best ways to get rid of unnecessary kilograms, model the body and improve physical form. This type of activity is recommended for people who are overweight, have problems with the spine and osteoporosis. To practice in the pool, you do not have to be able to swim because all the time you are under the care of a professional instructor. Next PostNext Is Listening to Music Good For Your Health?